Enrich your dinner table with the most delicious foods of American cuisine. Check out the more suitable prices of fresh products, BOGO deals, fresh-cut meat, deli-bakery, seafood for Lent, and more in the Meijer Ad content. 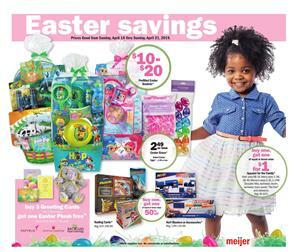 Add some products to your shopping list from the Easter range of deals from Meijer Ad. Save with digital mPerks coupons. Kraft shredded, chunk or crumbled cheese will be cheaper with the mPerks coupons. Red seedless grapes, honeysuckle frozen grade A turkey, and more items are also available in the fresh range of Meijer. The grocery range also covers meat & seafood. Buy Meijer spiral sliced half ham for only $2.49/lb. Meijer True Goodness sale covers frozen pizza and organic milk. Lenten specials are available on pg 3. Buy Atlantic salmon with herb shallot butter or crab stuffing for only $8.99. Reward system of the Meijer store is also one of the reasons to get these deals. Earn $2 off your next purchase when you spend $10 on Eckrich items. A lot of BOGO deals will be available for fresh products. Brussels sprouts, red or yellow potatoes, and more items are BOGO 50% off deals. Visit pg 4 to see the deli-bakery range. Get your probiotics from the dairy products. Chobani Greek yogurt is only 2/$5 with mPerks coupon saving. Easter candies will be on sale this week. Collect some candies to have them around when it's time to treat. Easter premium candy is gonna cost 2/$8 only. Subscribe to the Meijer Ad to get emails about future ads. Follow our Facebook page to track the posts like this one. BOGO Free sale is one of the best discounts of the Meijer Ads. Buy fresh foods including meat and fruits at Meijer stores. Extra large Avocados is only 5 for $5! Delicious deli sandwiches or lunch foods like fresh ham, turkey, chicken or cheese are also on sale. Find your favorite snacks or soft drinks. Coca-Cola, Pepsi-Cola or 7UP will be Buy 2 Get 1 Free deal. One of the best parts of beautiful mornings is the caffeine boost from a good coffee. K-Cups or pods of Dunkin' Donuts or Green Mountain are pretty popular coffee brands which you can find as a BOGO 50% off deal on the new Meijer Ad. Buy 5 Get 1 Free Single Serve yogurt or yogurt drinks. Spring is the season to enjoy outside and grilling. Check out fresh-cut meat and seafood products on pg 2 of this Meijer Ad. Buy 1 Meijer Shrimp to get second pack for half price. Make a great vegetable Greek salad with English veggies. Cucumber & feta vinaigrette make this salad so delicious and meal-like. If you are trying to deficit calories, salads are perfect replacement of lunch or dinner. It's a simple match, burn more calories than you eat. Stay healthy with organic foods, eat the most delicious versions of what you already love to eat. If you are a baseball fan, you can find some fan products on pg 7. Rawlings baseballs will be BOGO 50% off next week. Snacks, BOGOs, and more are available in that range. Follow the Meijer Ad on our Facebook page or subscribe to get emails. Buy your shampoo, body wash, soap, or medicines at Meijer stores for the prices of the latest Meijer Weekly Ad sale. You can find a lot of BOGOs on this part of the preview-ad. Also, supplements like whey protein, multivitamin pills, vitamins are on sale. Get a 10% discount on whey protein powder. Vega products also cost lower with the Meijer deal. Pay 20% lower for the Vega products. mPerks coupons are additional savings for most products in these Meijer Ads. Join customers who earn rewards with mPerks. Fill prescriptions to earn rewards. Save $3 when you buy Herbal Essences and more products. You can see that deal on pg 10. Get another $3 discount on Suave or TRESemme beauty or personal care products. Renew your stocks with the Buy 5, Save $5 mix or match sale. Nothing beats a quick food ready when you normally need to cook to eat something. It's an easy way to live and lower costs. If you are always in a hurry in your daily life, packaged meals are the best things because they are also cheaper than eating out. Get breakfast food to make your mornings more energetic. Jif peanut butter, Nature Valley Bars, and more items are in the mix or match range. Discover the prices of meat and seafood. Certified Angus beef boneless strip steak, Meijer 90% lean ground beef, Oscar Mayer Meat Franks are multiple-buy discounts or price drops from the Meijer Ad. Go to pg 2 Latitude 45 smoked salmon, Meijer cooked shrimp are both BOGO 50% off deals. One more delicious deal from the Meijer Ad is that of the BOGO 50% off sale of Deli specialty cheese. If you are a cheese person, you might possibly like pg 3 where different types of cheese are available. Find Sartori cheese wedge or bag, Boursin cheese, Amish country Swiss cheese, Black Cheek 2 year extra sharp cheddar, and more. Boneless Skinless Chicken Breasts $1.77 lb.